﻿ The Pavilion Hotel and Village, Nakhon Sawan | FROM $16 - SAVE ON AGODA! Have a question for The Pavilion Hotel and Village? 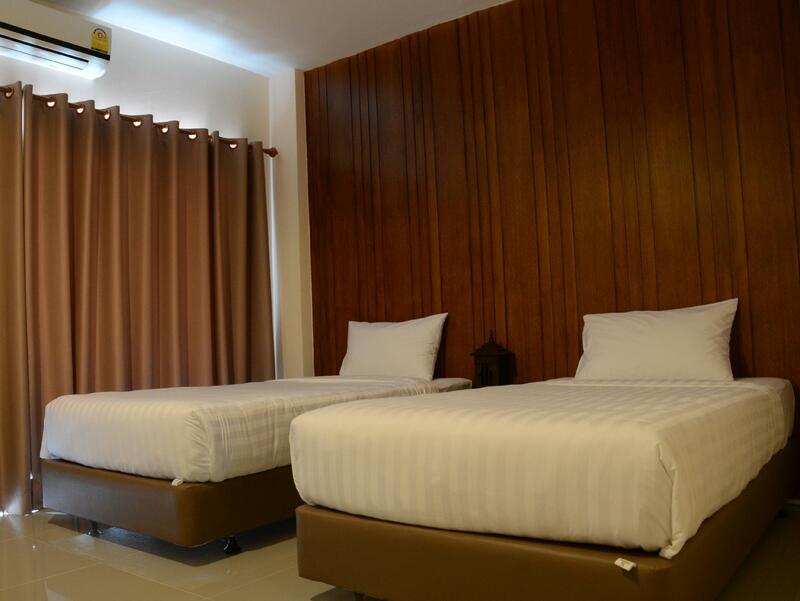 Offering quality accommodations in the business, restaurants, sightseeing district of Nakhon Sawan, The Pavilion Hotel and Village is a popular pick for both business and leisure travelers. From here, guests can enjoy easy access to all that the lively city has to offer. With its convenient location, the hotel offers easy access to the city's must-see destinations. At The Pavilion Hotel and Village, the excellent service and superior facilities make for an unforgettable stay. Guests of the hotel can enjoy on-site features like free Wi-Fi in all rooms, 24-hour front desk, express check-in/check-out, Wi-Fi in public areas, car park. The ambiance of The Pavilion Hotel and Village is reflected in every guestroom. clothes rack, towels, internet access – wireless (complimentary), non smoking rooms, air conditioning are just some of the facilities that can be found throughout the property. Besides, the hotel's host of recreational offerings ensures you have plenty to do during your stay. Whatever your reason for visiting Nakhon Sawan, the The Pavilion Hotel and Village is the perfect venue for an exhilarating and exciting break away. Value for money is the only thing going for this place. Great value...decent enough room...and a hot shower. If you don't have a car it'd be pretty hard to get around I imagine. The girl at reception wasn't great and booked us into the standard room despite me having paid for the Village Suite. After noting we were in the wrong room she seemed surprised that I should want the room I'd paid a little bit more money for AND it was 'far away'. It wasn't. The good thing about the Village Suite was that you could park your car next to your room. Would I stay again? Yes based on price. I've stayed at most of the 4* hotels in Nakhon Sawan and this isn't as good as the better ones but it's less than half the price. New hotel in the suburb of Nakhon Sawan, you may have your own vehicle to stay here due to 5-6 km. from downtown. About 500 metres to find restaurants and convenient store. Functional room and good atmosphere. Unstable wifi signal. Cleanliness is one of the good touching point of this hotel. Stayed a night here but was more than pleased. large, modern,spotlessly clean rooms. Staff were very helpful as well. Not close to the centre as such, but fine if you have a vehicle. Many eating street stalls an restaurants in the vacinity. The rooms here are spotlessly clean and attractively designed. The bathrooms were in good working order, though in one of our rooms, the sink leaked somewhat. Basic toiletries were provided, along with two bottles of cold drinking water in the mini-fridge. The beds were very firm by Western standards, but that’s par for the course in Thailand. By Thai standards, they were on the soft side. The staff were helpful and polite; one of them even helped carry our youngest child downstairs when she saw we were overburdened with our stuff. When we had to wait a bit longer than usual for our checkout, the staff person serving us was very apologetic. The location as shown here on Agoda is correct and it is just a short drive to malls and other attractions. One quirk about this place is that there’s only one outlet free for charging phones and other devices. So bring a splitter with you if you want to charge more than one device at a time. The worst thing about this place is there's quite a lot of garbage piled up in a long row behind the hotel. It's unattractive to look at, but the smell isn't a problem in the rooms as long as you keep the windows shut. The smell is more noticeable when you're in the parking area. I didn't get to talk to the staff about it, but I suspect that the area is being used by the community as an informal dump site, which means it's not entirely the hotel's fault. I’m sure they’re unhappy about it, too. Another problem was the guests. Many of them were very loud, slamming doors and talking loudly in the hallways early in the morning. The hallways themselves are long, tiled and obviously not designed with acoustics in mind, so every little noise gets amplified quite a lot. Overall, however, I liked this place. It shortcomings are manageable and I'd stay here again.